VoiceWaves Long Beach | Can Long Beach’s Cop Commission Really Police the Police? Can Long Beach’s Cop Commission Really Police the Police? The Long Beach Police Department recently told Pamela Fields, a local resident, that she could not pick up her late son’s cellphone, but she could “collect his bloody clothes” if she wanted to. Her son was Donte Lamont Jordan. He was 39-years-old when Long Beach police gunned him down late last year. Police accounts allege that Jordan fired a weapon at a dark-colored vehicle. Fields said her legal team’s findings change that narrative: he was carrying a cellphone, not a gun, when police shot him. Jordan, an African American, was just one of the 22 officer-involved shooting victims in 2013, with six occurring this year so far. 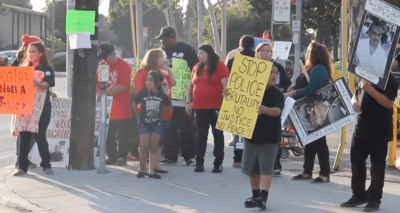 This year of police shootings in Long Beach comes at time when the nation is calling into question police community relations with the killing of unarmed Missouri youth Michael Brown by a Ferguson police officer this summer. An era of oversight has begun, with some departments requiring officers to wear mini-cameras to record their interactions with citizens, and others beginning to compile police interaction data into public databases, determining if racial bias exists. Locally, the Citizen’s Police Complaint Commission (CPCC) has served as Long Beach’s oversight body reviewing police misconduct allegations since 1990. But what powers does the CPCC really have? According to CPCC Chairman Jeffrey Price, the commission can subpoena witnesses, but not officers. “The officer has an officer’s bill of rights which protects them,” he said. In 2012, the commission received 654 total allegations, 86 percent of which were closed with a “No Further Action” finding, according to its annual report posted on the city’s website. About a third of the remaining allegations were found as “Not Sustained”, meaning evidence was insufficient to prove allegations of misconduct. Even if allegations are sustained, the commission’s charter does not give it the authority to discipline officers. “We only recommend to the city manager what our findings are. It’s up to the city manager to take that back to internal affairs and decide what, if anything, the punishment will be,” Price said. According to CPCC executive director Anitra Dempsey, while the meetings are public, the commission is limited to providing confidential recommendations on individual cases to the city manager. In fact, Fields, whose son was killed by LBPD officers last year, has never filed a complaint with the CPCC because she has never heard about them. That’s also the case for Jessica Loarca whose 21-year-old son, Jesse Delgadillo, was killed by the Long Beach Police Department on April 28, 2013. “When we hear there are people not aware of us, we recognize that,” Dempsey said. “We take advantage of every reasonable and ethical opportunity to share information about what this body does.” (The commission can be reached at 562-570-6891, with public meetings occurring the second Thursday of every month at city hall). The CPCC came under scrutiny in past years for being biased towards police, an allegation made by the CPCC’s own former investigator. Complainant demographics are also concerning. The 2012 CPCC Annual Report states that African-Americans make up about 43 percent of complainants, though only 13 percent of the city’s population according to the 2010 census. Latinos tend to file complaints less often. They make up 19 percent of complainants but about 41 percent of the population. On November 13, only one person attended the commission’s public meeting at city hall. According to Long Beach activist Michael Brown, residents don’t attend commission meetings because city leaders don’t promote the meetings and because residents ‘know they don’t work’. Brown asserts that the commission remains a ‘rubber stamp institution’. The mothers of those killed by local officers also have some ideas. Actually all the police shootings in Long Beach are reviewed by the L.A. County District Attorney and LBPD Internal Affairs, but none of the officers involved in any of the 2013 shootings have been charged, according to the district attorney’s office. The Long Beach Police Department did not respond to email inquiries on their use of force. Last year former LBPD Chief Jim McDonnell announced the establishment of the Use of Force Advisory Board in response to the unusually high number of police shootings in the city. McDonnell said earlier this year that “in almost all of these incidents, the suspect shot at or used a weapon either directed at an officer or at a third party victim.” Information on armed statuses of targets is not readily available for many local cases. Dignity and Power Now organizer Mark-Anthony Johnson said local statistics on excessive force charges is precisely what’s needed. Nationally, black youth are 21 times more likely to be killed by police than white youth, according to a ProPublica analysis of federal data. “We are there just to know what the City of Long Beach is doing to communicate with the community,” she said. As the focus on police use of excessive force narrows in on racism, some community residents argue race is not the only factor behind being a target of an officer-involved shooting. “Rich people do not get killed by cops,” Brown said. “Kelly Thomas was homeless,” he said, mentioning the 2011 case of a white homeless man killed by Fullerton cops. In 2010, Long Beach police shot and killed Doug Zerby, a working class white man, Brown said. Fields is still in legal battles with the police department, striving to seek what she sees as justice for her son. For support, she and Loarca have leaned on the shoulders of other mothers whose children have been killed in police shootings. These mothers have formed a group called the Young Survivor’s Legacy Network, with families ranging across Los Angeles and Orange County. “There’s a burgeoning movement happening out here. It’s actually unprecedented,” Brown said. “Don’t wait for it to happen to your family member. Get out here and be proactive. Michael is a 30-year-old journalist born to Mexican parents who started their own Domestic Violence counseling center in Southeast Los Angeles. As a college student, Michael was very active in campus affairs and graduated from CSULB in 2011 with research honors in Sociology and a Journalism minor. His articles have been syndicated at national sites including Mother Jones, New America Media, and ImpreMedia, the nation’s largest Spanish-language news publisher.